This feline is suffering from a mild case of MCD. Note the humanlike stance and channeling of Jesus into its fellow cat. Mad Cat Disease (MCD) is a recently discovered strain of virus, an epidemic of infectious virusness that is rapidly sweeping across the country. It is spread primarily through physical contact, saliva, and spam e-mails. As its name indicates, MCD occurs most commonly in cats, and even more commonly in housecats. MCD causes massive hallucinations, generally of an anthropomorhic nature, in cats and makes them extremely delusional. In mild cases, an MCD sufferer will attempt to walk on its hind legs, pretend to read a magazine, or stare blankly at a television screen for hours on end. More severe symptoms include a realization of their lack of thumbs, attempting to drive cars, and, in rare cases, trying to consume invisible cheeseburgers. Usually MCD will occur without any warning and infections typically last from two to seven days. Most pet owners notice little difference in their feline companions during a sudden onset of MCD, as, oddly enough, strange behavior is a characteristic closely associated with cats. For this reason, biologists debate the existence of MCD, saying that cats are virtually always in a disillusional state, thinking that they are in some way superior to humans. Another theory suggests the cats are correct. The first MCD-positive cat, shown here threatening to beat its owner if better food was not provided. The second-to-last sentence is now recognized as classic signs of MCD. The last sentence is now recognized as classic signs of denial. “ It was hardly a day later when the experience repeated itself, the cat now threatening to beat me, to scratch me, to pwn me — and at this point he insisted on calling me a "cat n00b" — and the day following, he scratched up my car! I lie not, I own a monster! A monster that is out to kill me! If threats from a cat were not enough to damage my ego, the following day he packed a suitcase and left. Eventually he returned, claiming that there are not enough bunnies to eat around here, and he decided that, despite his secret hatred for me and my household, he would have to stay. The blog continues on to describe further symptoms of MCD, as well as some hatred for a co-worker and sixty distinct uses for duct tape. These are some of the qualities observed in cats suffering from MCD. A cat, shown here objecting to the wrong placement of the desert fork on the table. An MCD cat may become hyper-sensitive to manners. Some cats may hiss at a human who forgets or outright refuses to say "excuse me" following a gaseous expulsion. 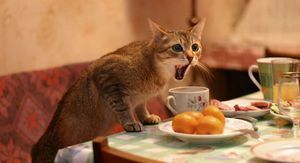 Others have been prone to inspecting a dinner table prior to dining, and more than one cat has been observed meowing loudly and firmly at guests that do not wipe their feet before entering. This cat's owner was extremely surprised to find their cat hovering in midair, but upon closer inspection, she merely thought she was in an invisible swimming pool. Cats are known for defying several laws of physics, and strong belief in objects that are simply not there can cause them to interact with said objects as if they were. This is usually seen in fully functioning normal cats, who chase after invisible objects and hear things that are not there — for example, an invisible rabbit can send them speeding across the front yard. 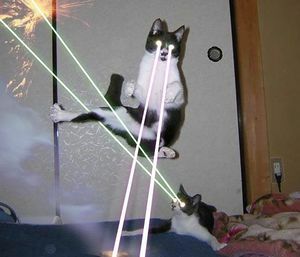 An MCD cat is more severe, however, and can see and make use of objects that do not exist. 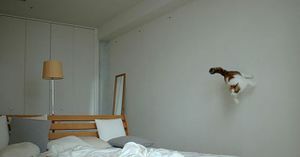 An invisible swimming pool can make them paddle in midair, and an invisible pillow can suspend them inches above the ground. A very confused cat riding his invisible bicycle. One of the most notable cases of an MCD cat's imagination gone wild was a sphinx cat named Fluffy, who nearly passed through the atmosphere believing he was in the space shuttle. 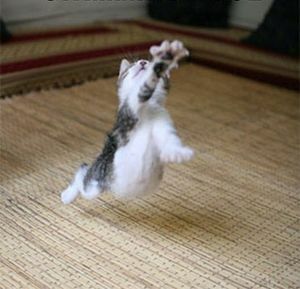 Another cat believed in an invisible cabal and was shot accordingly. An entire clowder of kittens fell through the ground because they had forgotten to believe it existed. One particularly psychotic cat wrecked an entire city with an invisible Hummer, while yet another miraculously saved an entire Sudanese village from starvation by supplying them with invisible sandwiches. 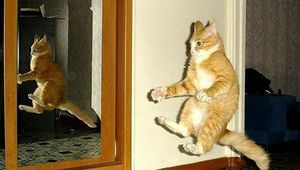 Scientists have yet to explain why it is that cats are powerful enough to disobey the laws of physics, but are very sure it has lots to do with quantum. Most cat enthusiasts agree it is because cats have always made their own rules from the beginning. While other animals have only one life, the cat has nine. While other animals fall to the ground in a heap, the cat can land on its legs. So why not drive invisible cars and suspend disbelief for a few minutes? A cat outright refusing to succumb to the discomfort of sand on its rear ever again. Because most delusional MCD cats believe they are human or can become such, they usually attempt to imitate human behavior. 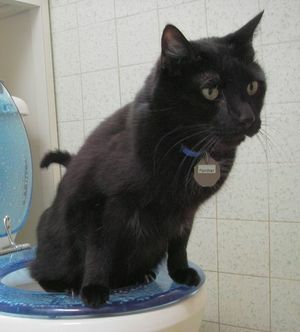 Besides the ways already described, cats may begin using toilets, communicating via the telephone, and belching regularly. Some cats, even after the MCD period has passed, refuse to give up these behaviors. 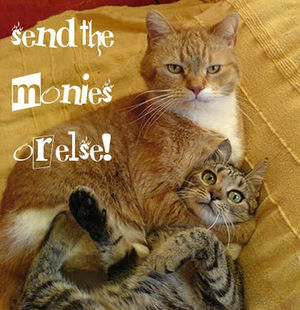 Younger cats with MCD will almost certainly give social networking sites a try and may even create their own MySpace. These cats will also almost certainly attempt to take the obligatory mirror picture and struggle with their lack of opposable thumbs. Some may become obsessed with the number of friends they have and have a spell of hairballs when they lose one. It is not recommended that an MCD-positive cat remain on MySpace for too long, lest they spread their disease through viral bulletins. 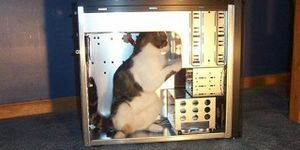 A cat after cleaning out a computer of all the buggy bits. Some biologists consider it an extension of human imitation that MCD cats hallucinate that they have the capability to fix anything. Most often MCD cats will attack that most fragile of machines, the home computer. The home computer is unique among most common household items because it can always be built bigger, stronger, and better. It holds a fascination for delusional humans and MCD-positive cats alike as being akin to Legos — no matter how carefully you put it together, it can still be broken in a fraction of a second. Typically, the first upgrade a feline will perform on a computing machine is an improvement in the Random Access Memory stores. After this comes deleting Windows and installing virtually any other operating system. Then it may enslave some hard drives into working for the one already in there. Banning the Internet may be used a solution to viruses and spam. Upgrades continue progressively until the entire computer is replaced with a typewriter because, statistically, it locks up far less often. These are some signs to watch out for to see if your cat may be suffering from MCD. MCD cats may have sudden mood swings and a craving for easy money. If your feline friend speaks with more hisses than usual, threatens your life or the life of another cat, or pukes up glowing purple liquid, your cat may have MCD. Most MCD-positive cats started out with a change of diet. If your cat is not eating at all, is eating very little, or is eating your neighbor's bloodhound, this could also be a sign of MCD. 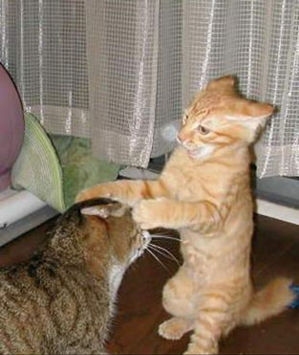 MCD-positive cats usually do not respond to catnip, but may respond to insulting their mother. If your cat has MCD it may become cranky and irritable. Unless this is normal for your cat, in which case you have nothing to worry about. Cat, depicted not ignoring the law of gravity, but grossly — and likely deliberately — misinterpreting it. MCD cats may become more reckless in behavior and may break, or at least greatly bend, laws. Always check your cat's catnip before administering to ensure it has not been spiked. Always look for sudden changes in your cat's mood and appearance. If your cat's fur goes from gray to neon green, it's not something to ignore. The only test for MCD is a simple one. If you question your cat's behavior at all, take it to the vet and have them run the tests. Just make sure you have a number two graphite pencil, and a scrap piece of paper to work out answers on. ↑ Debated. But that's what happens when you mix Jesus in with anything. ↑ In case you couldn't work that out. ↑ Not necessarily in order. ↑ This is what happens when the Socratic Method gets out of hand. ↑ But on a brighter note, he did live a very nice life and really enjoyed his last few days on the planet, because he hallucinated he became a prince. ↑ Although some may enjoy it. ↑ And also being cute and cuddly and having really big eyes and purring. ↑ There is no cabal. ↑ Legend says that the Cat was once on trial for all of the rules she broke. The judge was about to sentence the species to nonexistence when she purred loudly and tilted her head a bit to one side. The amount of cuteness immediately overcame the judge and Cat was let off free to do whatever she wanted. ↑ Although of course if they are also the type to be hyper-sensitive to etiquette, they will always remember to meow a quick excuse. ↑ Cats cannot read manuals, but this makes little difference, as humans possess the same difficulty. This page was last edited on 9 July 2009, at 05:02.